Ancient and forgotten recipes starred at the 2nd edition of the Festival della Pasticceria Tradizionale Mantovana (Festival of Mantuan Traditional Pastry-Making) that on 22 September 2018 gathered bakeries and pastry shops from the four provinces involved in East Lombardy, European Region of Gastronomy awarded 2017, namely Mantua, Bergamo, Brescia and Cremona. With the aim to promote the region’s excellent pastry culture, the Festival hosted pastry chefs from the different provinces who proposed both traditional desserts and recipes dating back to 19th and beginning of 20th century that have gradually disappeared from Mantuan kitchens and bakeries. In addition, pastry chefs were encouraged to present a dessert of memories, a recipe narrating a story from their childhood or family, or simply related to a sweet memory from their past. All recipes were accompanied by tastings of local wines from the province of Mantua. 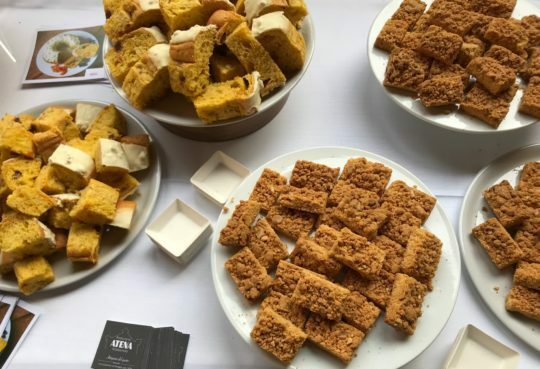 The event offered also the chance to taste the innovative dessert Convivium created in 2017 by Atena pastry shop from Sabbioneta (Mantua) and chosen to represent East Lombardy. As a symbol of the synergies that the European Region of Gastronomy programme has generated among the four different provinces, the ring-shaped Convivium cake combines some of the most outstanding ingredients from all the territories involved such as: Garda Olive Oil PDO (Brescia); Moscato di Scanzo wine (Bergamo); Torrone icing (Cremona); and pumpkin cream filling (Mantua). Organised by the Municipality of Mantua together with the Mantua Wine and Flavours Route at the Art Nouveau building Loggia del Grano (Mantua), the Festival represents a remarkable example of the legacy of the European Region of Gastronomy title that contributed to boost the gastronomic profile of East Lombardy, granting prominence to the region as a food destination.